Sapphire is the birthstone for September. 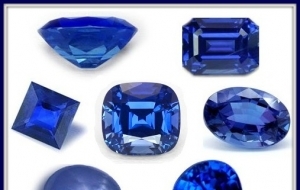 The blue sapphire is most commonly known but sapphires come in many shades of pink, orange, yellow, green, purple and black. The largest sapphire weighs 61,500 carats that was discovered in Madagascar. Sapphires are traditional gifts for the 5th, 23rd, and 45th wedding anniversaries. Sapphires stand for truth, sincerity, and faithfulness. Sapphires are becoming more and more common on engagement rings for this reason. Prince Charles chose a sapphire for Princess Diana’s engagement ring.